Shaving with soap and a brush is one of the oldest and most traditional shaving methods out there. The soap and brush method of shaving has been practiced for centuries, possibly beginning in or around the 4th century BC. The soap and brush method works well for many reasons; it’s stimulating and soothing and effective. If you’ve decided to go back to the basics and shave in a more masculine and traditional manner, you’re in the right place. Below, we will walk you through the process of shaving with a brush and soap from start to finish. Let’s begin! 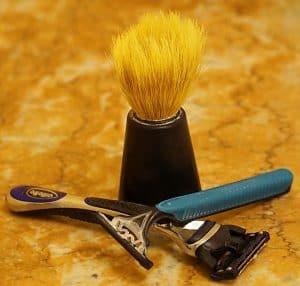 How do you properly use shaving soap and a brush? Why is The Brush and Soap Method So Effective? Understanding how to properly shave with a brush and shaving soap isn’t as complicated as you may think. If you understand the method, have the proper tools and follow the following steps correctly, you’ll be shaving like a pro in no time. To properly shave with soap and a brush, you’ll need to understand why this method works so well. The way you shave can directly impact the health of your skin, pores, hair, and hair follicles. When you lather your face using soap and a brush, the specially designed brush bristles stimulate slack hairs and lethargic hair follicles to help ready your pores for shaving. As you apply the soap, minuscule hairs and flattened follicles get lifted, stimulated, exfoliated, and cleaned. The freshly lathered shaving soap then serves to protect, lubricate, and soothe your delicate facial skin. As you glide your razor through the soap to remove unwanted hair, you’ll find the entire shaving process to be a bit easier and significantly more hygienic. This helps to reduce bacterial infection, acne, and razor burn. It’ll also give you a closer shave. To take things up a notch, steaming your face before you use your lathering brush will open up pores and soften stubborn beard hair. At the end of your shave, you may also find it prudent to apply an aftershave balm. This will give your skin a fresh scent and soothing antibacterial finish. 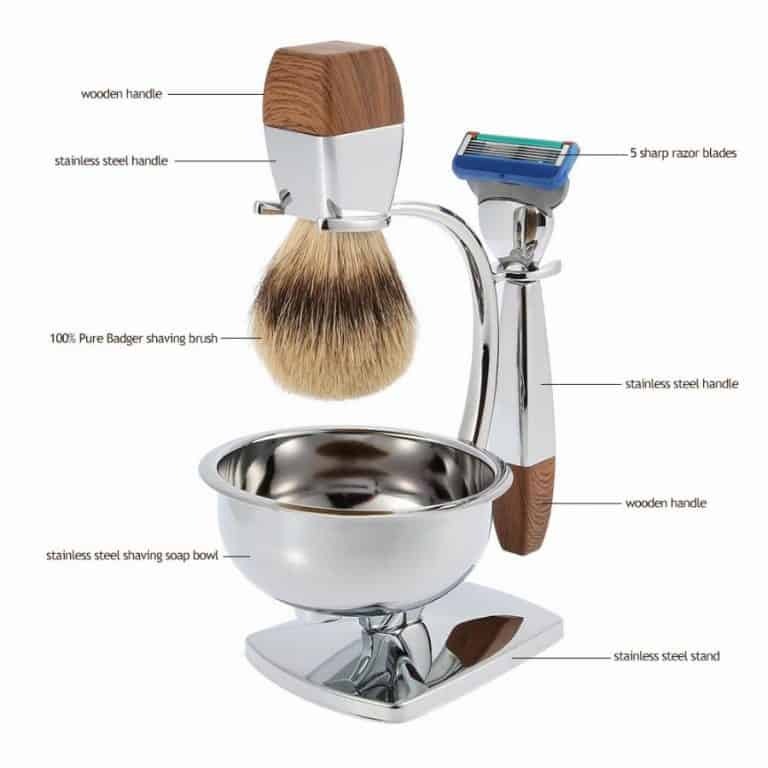 Knowing what tools you will need before you embark on your shaving journey is important. There are a few critical components that you’ll want to have before you begin shaving with soap and a brush. These tools can be purchased separately or as a kit. Shaving brush –A good shaving brush will be made of badger hair or similar synthetic hair materials. Shaving bowls –Your shaving bowls will be where you mix and lather soap and soak your shaving brush. If you don’t have bowls, clean mugs will work as well. Quality shaving soap – Choose a soap that has been specifically designed for shaving and lathering. Hand soaps and bar soaps aren’t what you’ll want to use. If you have sensitive skin, opt facial shaving soap free of dyes or scents. Razor – You can use a straight razor or your regular razor with this method of shaving. Warm water – Don’t shave with excessively hot or cold water as it may damage your delicate facial skin. Clean towel – A clean towel is important. Don’t use towels that may have bacteria on them as they can cause breakouts or razor bumps in newly opened pores. Before you start shaving, you’ll want to prepare your face and have your tools cleaned and easily accessible at arms reach. Showering before you shave is a good idea; the steam from a shower can open and clean your pores to reduce the possibility of razor burn and acne. If you’re in a hurry, wash your face, and then wet a clean towel with warm water. Press the towel gently to your skin and hold it there for about 1 minute to open up your pores. Rinse with warm water, and let your face remain slightly damp as you begin to lather and shave. Build a lather in your shaving bowl by soaking your brush and your soap separately in warm water and then stirring them together to create a light and fluffy shaving foam. Let your soap and brush sit and saturate in separate bowls of warm, clean water, for about 3 minutes. This process is called blooming. Squeeze the excess water from your brush and then pour any excess water out of your shaving bowl. 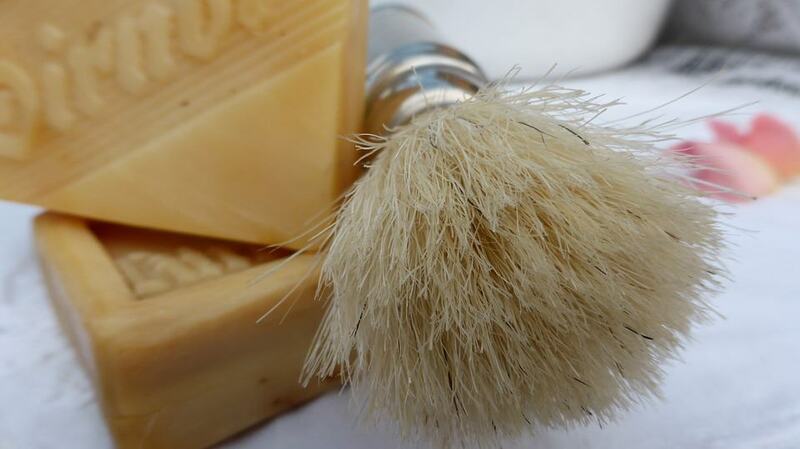 Pinching the bristles of your brush together, you can begin stirring your shaving soap using a circular motion. Stir your soap for around 30 seconds to build a foamy lather. Load your brush. This can be done by pumping and swirling your dampened shaving brush in your bowl of shaving soap. Load your brush up with as much soap as you can. Paint your face. This should be done in an upward sweeping motion that creates an even layer of shaving lather while stimulating your pores and hair follicles. This step is easy. Just shave your face as you normally would with a clean and adequately sharpened razor. Cleaning your tools and face is an important but often overlooked part of the brush shaving process. After you’ve finished shaving your face, remove excess soap, rinse your face in the luke-warm water, and apply a shaving balm if you wish. Remember to thoroughly clean and dry your tools to prevent micro-bacterial growth and rust. Rinse the excess soap from the top of your shaving bowl and let the remaining soap dry. So there you have it! The entire brush soap and shaving method from start to finish. This tried-and-true way of hair removal can be a satisfying and therapeutic part of your daily hygiene routine when done properly. We hope that this guide has been helpful and wish you the best of luck as you embark on your brush and soap shaving journey! You may also want to check out these additional links for more tips and tricks on the brush shaving method. Prim & Prep: How to Lather Shaving Cream with a Brush! Let’s Break Down the Steps!